Hello Fangirls and Fanboys! I am happy to see you here at My Fangirl Life. It’s always lovely to see you. Yes, I realize I can’t actually see you but I like the idea that we are all connecting. We could be located on opposite sides of the world and yet you are reading my words and if you left me a happy comment down below I could be reading yours too. That’s one of my favourite things about comments… it’s like making new, virtual friends. 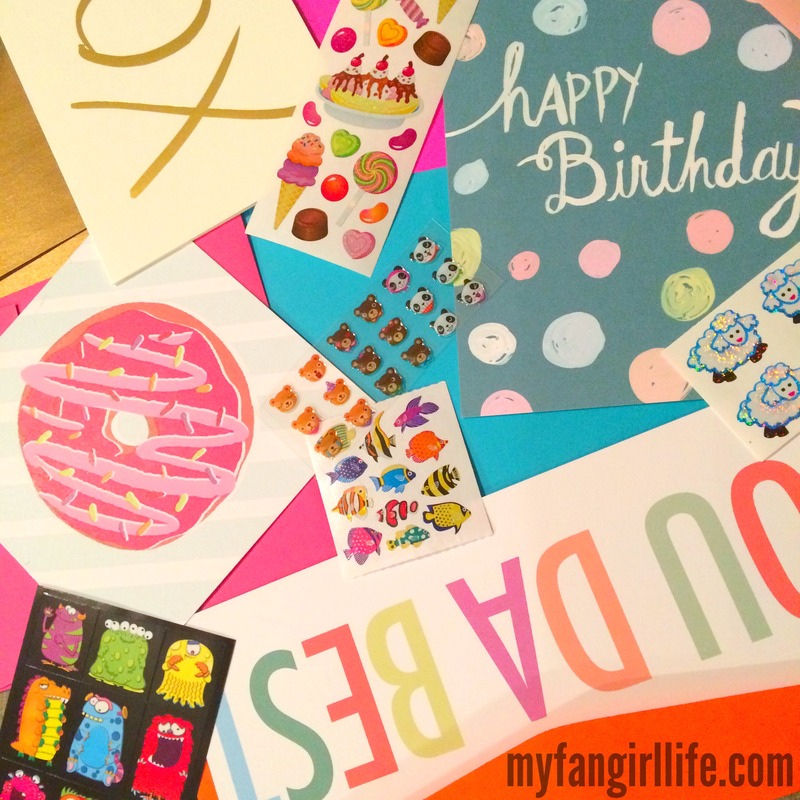 I recently started connecting with people in a new way: via the International Geek Girls Pen Pal Club. This website is turning two years old this month, but I only came across it two months ago. It seemed like such a brilliant idea and I just HAD to join. The premise is that it is a place for nerdy girlies to connect… whether it is on a message board, or by signing up for a pen pal or by joining a swap. I am about to embark on my first pen pal adventure this month. I am so excited because I LOVE mail. But that’s not what I want to talk about. What I want to talk about are the Swaps. “What is a Swap?” you ask, genuinely curious because you are such a good virtual friend. It is when you send a little care package to a new buddy. Each month multiple themes are announced. You can pick one (or all of them) based on your interest & commitment level. Sometimes it’s just cards. Sometimes it’s a whole, well-stocked and fully-thought-out package. But it’s always fun! After you sign up you are randomly matched with a partner (who could live anywhere in the whole world!) via email. You then exchange addresses and any other important swap-related (or non-swap-related if you’d like) information. Need more convincing? Here are a couple of examples from swaps I’ve done in the past! I did this one in January. I sent some awesome Vs Stuff Socks to the lovely Ruth in the UK. She sent me some adorable Bambi Socks and a pair of Batman Slippers (which are super comfy). This was last month… because who doesn’t want a Valentine’s Gift from their fictional crush? My awesome swap partner Kellie & I took different approaches to this one after we’d exchanged lists of our top fictional crushes. I picked one of hers and created a package made by that dreamboat… in this case the Tenth Doctor. 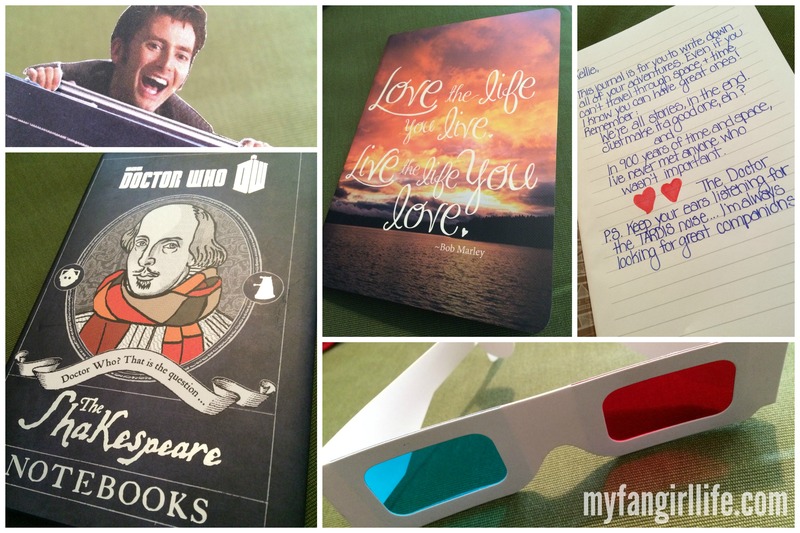 It include a book about Shakespeare’s run-ins with the Doctor – as he is a great writer of love stories – and a journal for her to write about her own adventures, with a special note from the Doctor himself in it. I topped it up with a few Ten-related trinkets: a bookmark of him popping over the cubicle wall and old-fashioned 3D glasses. Kellie made a package with little notes & trinkets from multiple of my crushes. There was some eyeliner so I could look as dreamy as Hook from Once Upon a Time. 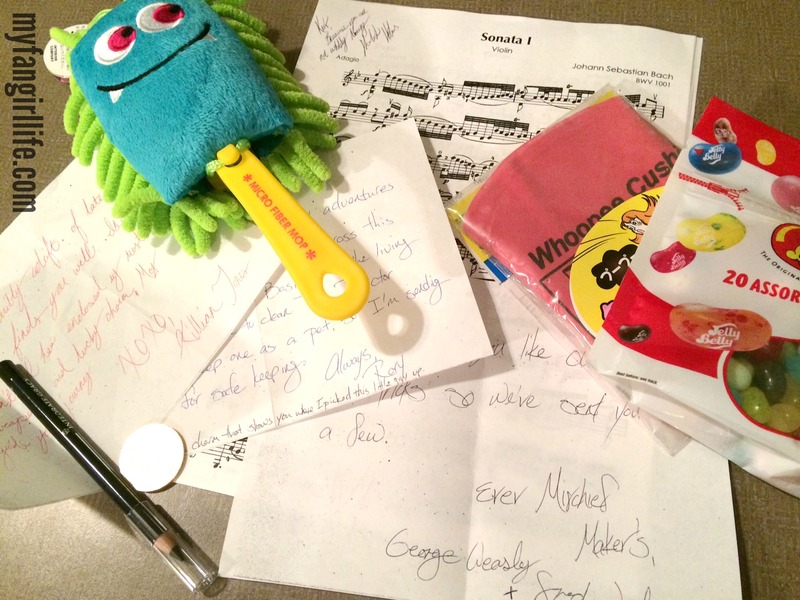 Sherlock sent violin sheet music because I’m “not wholly boring.” Rory sent me a gift from a planet full of cleaning monsters he stopped at with Amy & the Doctor. And the Weasley Twins told me to manage some mischief with the joke products they included. It was so fun to open, especially because I am a master of suspending disbelief. Will you be signing up? Maybe we’ll be a match! Or you could just leave me a little message in the comments! I love comments, friend!